With one of the most lucrative prize packages in sportsman drag racing today and a racer base that has grown exponentially over the past decade, the 2014 SuperSeries programs will once again award championships in the Top, Mod and Junior Dragster categories in addition to handing out over $240,000 in cash and prizes to racers from all corners of the world at the IHRA Summit World Finals at Memphis International Raceway in October. And once again taking center stage this year are the two prize dragsters awarded to the winners of the Top and Junior Dragster classes. In 2014 the SuperSeries prize dragsters will feature an elaborate design provided by Imagine That Customs in conjunction with Summit Racing Equipment and a race-ready setup with parts donated by many of today’s leading racecar parts manufacturers. The big dragster will be built by TNT Supercars based out of Forney, Texas with a 572 big block Chevrolet engine provided by Trick Flow Specialties powering it down the racetrack. The Junior Dragster will be built by JR Race Car based in Greeley, Colorado. The two turn-key dragsters are just part of the amazing prize package that the winners of the Top, Mod and Junior Dragster classes will take home in 2014. Each prize package includes $10,000 for the championships in Top and Mod and $3,000 for winning the championship in Junior Dragster. The packages also include a number of additional prizes. The Summit SuperSeries is the IHRA’s most prestigious sportsman program designed to reward local bracket racers with an opportunity to compete on the biggest stage in racing. Providing the base for the program are the more than 100 IHRA member tracks in seven divisions. Drivers compete year-round at their local track for an opportunity to represent their home track at the Summit Team Finals. Once at the Team Finals level, drivers then compete against track champions from other IHRA facilities for the right to go to the World Finals and compete for the World Championship in their respective class. To celebrate the two biggest prizes in the sport, IHRA.com will be taking a an in-depth look at the companies and parts that make up one of the biggest and best prize packages in the sport. 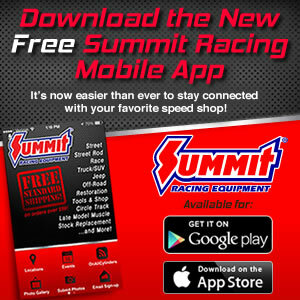 Follow along right here on www.ihra.com beginning next week and running through the Summit World Finals as we highlights the many great companies that help make this program possible.